Coming soon to the Capitol: The rift over school reforms, RFRA’s return, MARTA’s $8 billion pitch, Milton County redux, and more. This coming Monday, state lawmakers will travel from the far reaches of the state—from Albany and Brunswick to Young Harris and Zebulon—to the Georgia State Capitol for the 2016 legislative session. Between the time they chow down at Sunday night’s Wild Hog Supper and toss shredded paper into the air on Sine Die, politicians will hash out important policy, pass a bunch of meaningless proclamations, and introduce their share of absurd bills—i.e. the one to make English the official language of Georgia (again)—intended to spark controversy. Expect this 40-day to go by relatively fast. After all, it’s an election year. Following 2015’s nearly $1 billion transportation bill, which included the passage of a tax hike to fund overdue road repairs, some Republicans in the GOP-controlled legislature are likely to face primary challengers backed by anti-tax crusaders. Incumbent state reps and senators will be eager to adjourn in order to start raising funds for the campaign trail—something they’re prohibited from doing during the session. Before they leave town, Georgia’s part-time, $17,000-a-year lawmakers are required by statute to accomplish one mission: Approve the state’s annual budget. With the state’s tax revenue up by 9.1 percent—approximately $700 million—in the first five months of the current fiscal year, officials will debate how to spend potentially more than $23 billion in what could be the state’s largest budget ever. Pour money into schools? Give struggling hospitals a shot in the arm? Dedicate funding toward transit for the first time since, well, ever? Better not get ahead of ourselves. Many more details will be revealed in the next few weeks. But here are some of the key questions the lawmakers on their way to Atlanta face coming into the 2016 legislative session. Lt. Gov. Casey Cagle (from left), Gov. 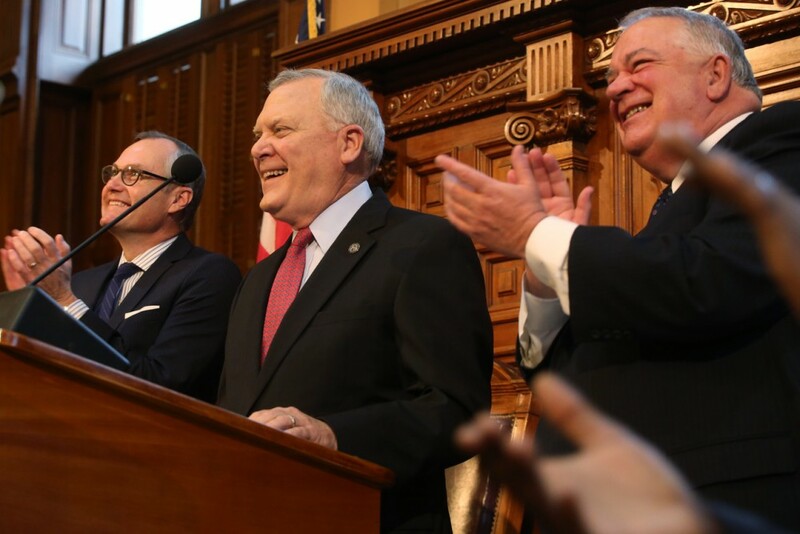 Nathan Deal, and House Speaker David Ralston at the 2015 “State of the State” address1. Gov. Nathan Deal wants to reform how Georgia’s public schools are funded. Can everyone get on board with his plan? The question of how to improve Georgia’s public education system—ranked sixth worst in the nation—is a perennial issue. After spending his first term focused on criminal justice reforms, Deal recently has shifted his attention toward the state’s struggling schools. “Education reform is the ultimate criminal justice reform,” Deal said last month at a PolicyBEST breakfast. A major thrust of his plan involves rewriting the state’s complex funding formula—known as Quality Basic Education—that determines how much money each school receives a year. QBE has remained unchanged since its launch in 1985. To portray the program as outdated, the septuagenarian governor compared it to parachute pants, jelly shoes, and a Commodore 64 during last year’s “State of the State” address. Based on recommendations from his handpicked Education Reform Commission, Deal intends to simplify the rules for funneling money to classrooms. As part of that effort, he plans to boost education funding by about a quarter-billion dollars each year, provide schools with greater flexibility in spending cash, and tie teacher pay to student test scores. That last initiative—recently referred to as the “hoverboard of education” for its potential to burst into metaphoric flames—is already facing strong pushback from teacher associations. Democrats, including Atlanta state Sen. Vincent Fort, also worry the reworked formula could “codify austerity cuts” from the past decade that would in essence guarantee schools are permanently underfunded. The Georgia Budget and Policy Institute estimates schools have been shortchanged more than $8.9 billion since 2003. 2. Is state control the answer to turning around failing local schools? While the QBE funding debate takes place, dueling campaigns will ramp up over the scheduled November 2016 referendum to decide whether Georgia should establish an “Opportunity School District.” If approved, the governor would appoint a superintendent to take over up to 20 schools that have scored below 60 on the state’s College and Career Ready Performance Index for three straight years (Georgia has 141 that fit this criteria, including 27 in Atlanta). Though supporters point to Louisiana’s OSD as a model for success, critics believe the measure gives the governor too much power and, more importantly, aren’t convinced it will work in Georgia. They instead would like to see better teaching, higher-quality classroom curriculum, and increased funding in struggling schools. Will this train make its way up to Alpharetta anytime soon?3. 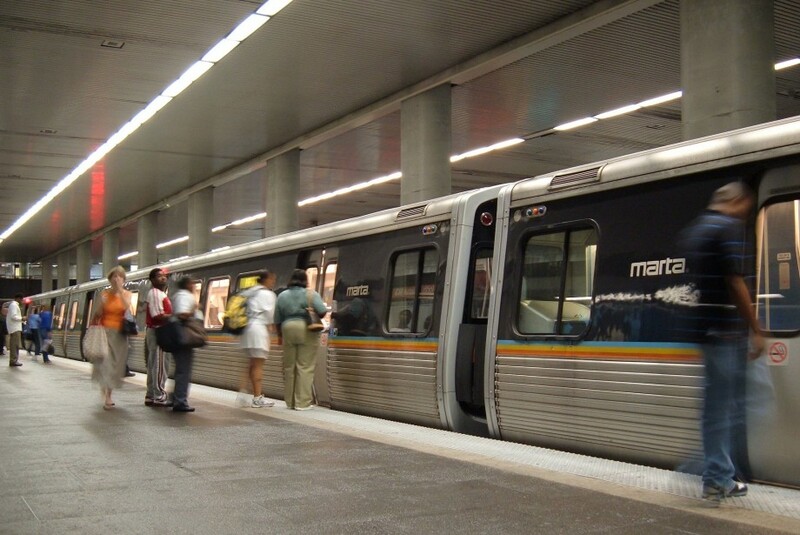 Will the growing love affair between Keith Parker and Republican lawmakers pay off for MARTA? Last March, when lawmakers raised taxes to fix the state’s road and highways for the first time in nearly two decades, they also helped MARTA. Though House Bill 170 didn’t provide it direct funding, the once-troubled transit agency saw some burdensome financial restrictions lifted. It also set the stage for MARTA to return for state funding in 2016—which would be a major step toward paying for its massive $8 billion expansion plan. MARTA CEO Keith Parker, who convinced skeptical Republicans to reconsider his agency’s merits, now wants legislators to let Clayton, DeKalb, and Fulton residents vote on whether they should raise their own taxes to fund future transit investments, including the construction of three new rail lines. So far, the signs are encouraging. “I don’t know if MARTA will expand and, if it does, I don’t know what it might look like,” House Speaker David Ralston said at last month’s PolicyBEST meeting. “But I do know that major companies who seek out our state want reliable transit options in metro Atlanta.” And it’s not just top leadership; even south Georgia lawmakers are coming full circle on recognizing how MARTA benefits the whole state—not just metro Atlanta. Read more: Keith Parker puts us back on track: The man who saved MARTA believes it can save us all. Will we get on board? 4. The “religion freedom” bill has returned. Will Georgia learn from Indiana’s costly mistake? Depending on whom you ask, Georgia’s “religious freedom” bill is either key to protecting or gutting our First Amendment rights. For the third consecutive year, state Sen. Josh McKoon, a Columbus Republican, will attempt to push his “Religious Freedom Restoration Act” through the General Assembly by claiming it’s needed to protect religious rights from government intrusion. Each year he’s faced growing opposition from LGBT activists and clergy members who argue the law is not just unnecessary, and but would also permit business owners to discriminate against customers. As a result, Georgia’s corporate community has ratcheted up its opposition after seeing Indiana take a $1.5 billion economic hit following protests over a similar kind of law passed last year. According to the Metro Atlanta Chamber, Georgia would stand to lose more than $1 billion in convention business and sporting events if RFRA were to pass. (McKoon counters with another fact: Seven of the last 10 Super Bowls have taken place in states where RFRA already existed.) This year, however, McKoon has an ally in state Sen. Greg Kirk, an Americus Republican, who plans to drop a bill to protect public employees who have religious objections to gay marriage. Does the name Kim Davis ring a bell? Read more: The rumble over religious freedom: Will Georgia’s most divisive bill help or hurt the state? 5. Georgians can’t legally access medical marijuana in Georgia. Will the state’s new law be fixed or remain broken? Last year state lawmakers did what was once inconceivable by legalizing medicinal marijuana. Well, sort of. The measure, which allows the use of cannabis oil for a limited number of ailments, didn’t make it legal for pot to be grown in Georgia so that the oil could actually be produced. State Rep. Allen Peake, the Macon Republican who authored the medicinal marijuana bill, is looking to correct that legislative oversight. However, he’ll have to work against Deal’s opposition to in-state cultivation. (Peake recently stepped down as the governor’s House floor leader.) Peake appears to have popular support, as a recent poll found two-thirds of Georgia Republican voters favor his stance; backing from lobbyists hired by at least two medical marijuana companies, and Ralston’s endorsement. Will that be enough to help Peake in his fight? Read more: Medical marijuana is legal now in Georgia. So how do we get it here? MGM Resorts International officials, who are pushing for casinos to be legalized, point to the company’s $1.3-billion resort being built outside Washington D.C. for an example of what could come to Georgia.6. Casinos are pulling out all the stops to legalize gambling in Georgia, but how far will it get them in a state filled with evangelists? There won’t be a casino built at Turner Field. But what about elsewhere in Atlanta? Or the rest of Georgia? A fierce debate will occur over the potential legalization of as many as six Georgia casinos. Supporters will be talking in dollar signs: the hundreds of millions in gambling taxes that could flow to the underfunded HOPE scholarship program, as well as a potential $5 billion statewide annual economic impact. But religious activists seeking to preserve Georgia’s morality—whatever amount still remains—will battle back by stoking fears that casinos could lead to the rise of problem gamblers and a spike in local crime rates. For Georgia to go all-in, two-thirds of state lawmakers would need to support the effort, followed by a successful statewide referendum, and then local approval from voters who live in areas near proposed casinos. It’ll be an uphill fight, but casinos have hired an army of lobbyists to do their bidding this year. Read more: Georgia lawmakers say casinos could save the HOPE scholarship. Is the fix already in? 7. The Affordable Care Act isn’t going anywhere. Will lawmakers find a way to expand Medicaid? Republicans seeking to overturn the Affordable Care Act saw their hopes dashed last summer when the U.S. Supreme Court ruling effectively upheld the law for good. With Obamacare here to stay, Georgia lawmakers are left to fix a state healthcare system that’s seen five rural hospitals shutter in the past three years and a dozen more facing closure. Even larger public hospitals are on the brink of scaling back vital services, like the mental health clinic at Grady Memorial Hospital. Many Republicans still oppose expanding Medicaid—which would provide more than 400,000 Georgians with healthcare coverage—mostly due to financial concerns and continued political objections to the law. However, they’ve failed to come up with another solution for insuring those Georgians. So what happens next? Major reforms are unlikely to pass before the 2016 election, officials say. But the groundwork for a finding a solution is finally starting to be laid. The influential Georgia Chamber has hired two former Deal aides, spokesperson Brian Robinson and health policy adviser Blake Fulenwider, to lead a bipartisan effort to find a way to avoid a looming healthcare crisis in 2018. If nothing happens before then, payment cuts that were intended to be offset by Medicaid expansion will go into effect, placing Georgia hospitals into a deeper financial crisis. While Robinson said it’s too early to talk specifics, the effort to expand Medicaid by another name will slowly take shape in the coming months. His pitch: Closing the coverage gap isn’t just a moral obligation; it’s good for the economy. Read more: HHS Secretary: States like Georgia will eventually see the merits of Medicaid expansion. 8. 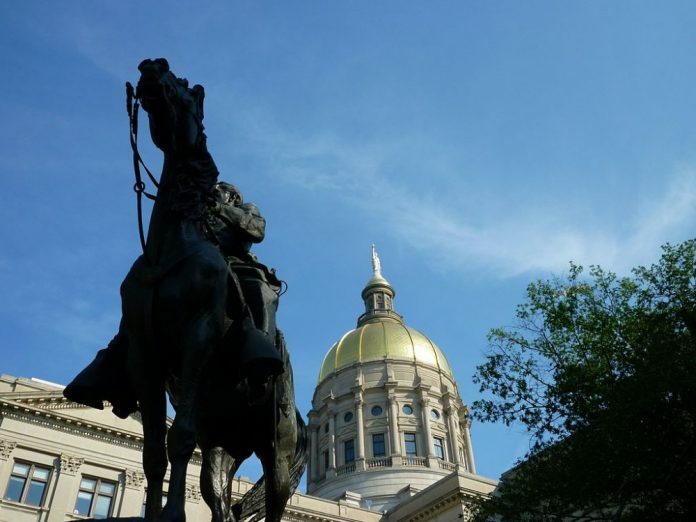 Georgia’s craft brewers are fuming over the 2015 legislative session. Will the booming new industry get a fair shake or lose out to distributors? When Senate Bill 63 passed last spring, Georgia’s craft brewers believed it would be a boon to the burgeoning industry. The news was huge: They could effectively sell beer directly to consumers—a measure that circumvented an old state law that required sales to go through a distributor. The law’s intended effect, however, was gutted when the Georgia Department of Revenue issued a memo with “clarifying language” that undermined the intent of the bill and cost some small business owners thousands of dollars. If they didn’t comply, DOR officials said, they could be fined and lose tasting room privileges. The Georgia Craft Brewers Guild wants to revisit the legal snafu when legislators return to Atlanta. They’ve already gained two key allies: House Speaker David Ralston, who has several small breweries in his district, and Senate President Pro Tem David Shafer, a frequent supporter of alcohol wholesalers, strongly encouraged the DOR to align its policy with the law’s intent. “If they don’t, we may have to,” Ralston recently told the AJC. Read more: Emails: Georgia officials catered to distributors’ wishes over those of craft brewers. 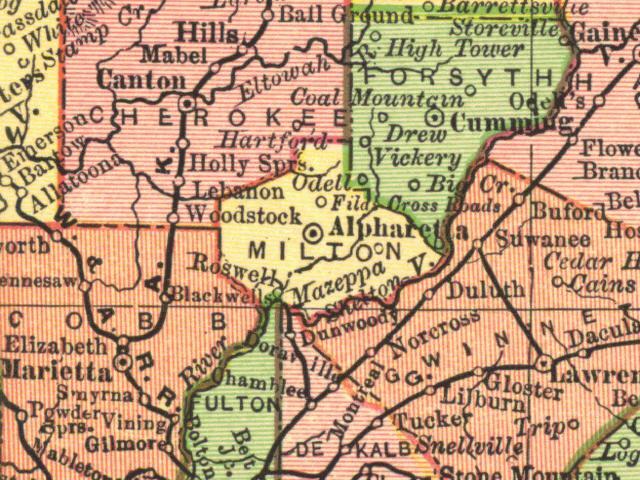 An 1895 map of Milton County9. Will we see the return of Milton County and the end of DeKalb County’s CEO gig? Yes, your favorite effort to split Fulton County in two is back. Under a new measure introduced by state Rep. Brad Raffensperger, a Johns Creek Republican, voters statewide would decide if the state constitution should be amended to allow for the “re-creation of a previously existing county which was merged into another county may be accomplished by law.” What does that mean? Four words: Bring back Milton County. The proposal resurrects an old fight between white, affluent North Fultonites who believe a county of their own would put their tax dollars to better use and a more diverse South Fulton constituency that doesn’t want to be left footing the bill for MARTA and Grady Memorial Hospital. The measure would require two-thirds approval from legislators, passage of a statewide referendum, and approval on the county’s ballot. Fulton won’t be the only metro county facing big changes. In 2015, DeKalb’s government has had a hellish year between the conviction of ex-CEO Burrell Ellis, the continued foibles of interim CEO Lee May, and a host of other corruption allegations. In the wake of that maelstrom, state lawmakers representing parts of the county are pushing to abolish the CEO position altogether. While Republicans from the county’s northern end have long wanted a new form of local representation, state Rep. Scott Holcomb, Tucker a Democrat said he’ll carry legislation intended to do away with the county’s top position. Whether other DeKalb Democrats follow suit, especially ones in the county’s southern parts, could determine his success. 10. How will guns factor into the legislative session? Two years ago, state lawmakers caused a international uproar by passing House Bill 60—known as the “guns everywhere” bill—that allows guns into unsecured parts of airports, bars, and churches. After a quiet year in 2015, gun lobbyists are seeking further expansion of their Second Amendment rights. “We’d like the ‘guns everywhere else’ bill,” said Georgia Carry Executive Director Jerry Henry. What would that look like? He wants to make it even easier to bring guns into churches, which currently must “opt-in” to allowing firearms on their premises. In the wake of recent campus shootings across the country, Henry also expects to see another push to legalize campus carry, reviving a failed effort from two years ago. That effort could either gain momentum behind an overlooked 2015 campus carry measure from state Rep. Heath Clark, a freshman Republican from Warner Robins, or a forthcoming bill yet to be introduced. On the other side of the aisle, state Sen. Michael Rhett, a Marietta Democrat, wants to give judges the ability to restrict people getting a divorce from buying a gun. He’s referred to his bill, inspired by the 2014 shooting of a Fulton County prosecutor by her estranged husband, as an “anti-domestic violence” measure. State Rep. Keisha Waites, D-Atlanta, wants to require firearms safety training for anyone attempting to get a concealed weapon permit. Both of these bills, as with as all gun-control legislation, face uphill battles in a state known to promote Second Amendment rights. Don’t be surprised, though, if a few more gun-control bills grab headlines, even if they have no chance of passing in a red state. 11. Will AirBnb, the latest disruptive startup in Georgia, face major threats like Uber and Tesla did in recent years? When Uber, Tesla, and AirBnb arrived in Georgia, the startup companies all experienced a similar path: Disrupt an old way of doing business, grow wildly popular among new consumers, and face regulations by lawmakers rooted in tradition. Ridesharing companies like Uber, which in recent years faced a host of restrictions designed to protect the entrenched taxi industry, had to submit to a law requiring background checks for drivers. Tesla, the luxury electric carmaker, fared a little bit better: After facing pushback from car dealers over its direct sales model, the electric vehicle company convinced lawmakers to let them bypass a longstanding law requiring independent dealers to sell cars to consumers. Now it’s AirBnb’s turn. Tourism officials are angry that the short-term rental platform has gotten away with sidestepping hotel regulations. The company became the subject of a 2015 study committee that’s considering potential regulations. What might they look like? A cap on the number of days each year that a residence could be rented—potentially somewhere around two weeks— before the property would become taxed like traditional motels and hotels.